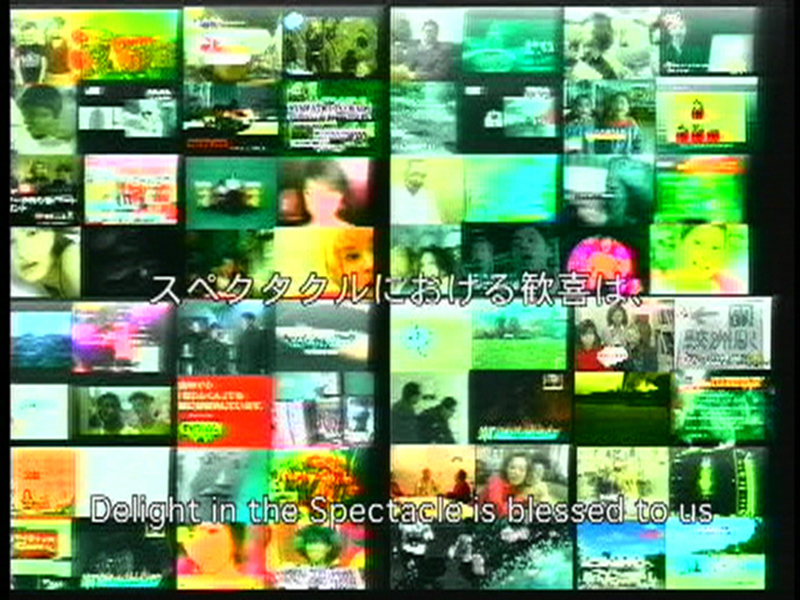 The Queens Museum of Art is pleased to announce a special U.S. premier of Japanese artist Masayuki Kawai’s video work About a Theological Situation in the Society of the Spectacle (2001). Selected by guest curator Cristine Wang, Kawai’s work will be on view in the museum’s small theater from November 3-December 1, 2002, as part of New York City’s landmark Asian Contemporary Art Week. Asian Contemporary Art Week (ACAW) is an initiative of the Asian Contemporary Art Consortium, and brings together an unprecedented alliance of curators, artists, educators and scholars in a city-wide program of exhibitions, performances, lectures, and events. For information on ACAW, visit http://www.asiasociety.org/acaw. Masayuki Kawai was born 1972, in Osaka, Japan, and currently lives in Tokyo. He received a B.A. in Aesthetics from the University of Tokyo, and founded the Videoart Center Tokyo in 1999. A publisher and critic of contemporary video art, Kawai’s video works have been shown internationally including: Clermont-Ferrand Short Film Festival, France (2002); Oberhausen International Short Film Festival, Germany (2002); European Media Art Festival, Osnabrück, Germany (2002/2001); Sydney Film Festival, Sydney, Australia (2001); Microwave International Media Art Festival, Hong Kong (2001); Leeds International Film Festival, England (2001); and the Rotterdam International Film Festival, The Netherlands (2001). Cristine Wang is a New York-based independent curator and critic. She recently curated Defining Lines, Manifesta 4, Frankfurt, Germany (2002); Re:Duchamp Exhibition, 49th Venice Biennial, Italy (2001); Dystopia + Identity, Tribes Gallery, New York (2001). Wang curated the online exhibition Defining Lines: (2002), included in the Whitney Museum’s “”Artport”” website. She was on the International Jury for Oberhausen Film Festival, Germany (2002), and is on the Committee for the Paris Biennial (2002). Press Contact: Carolyn Bane, (718) 592-9700 ext. 147 or cbane@queensmuseum.org. For more information about this project, visit www.cristine.org. Support for this project is gratefully acknowledged from Name.Space, Progressive IMG, and The Wang Family Trust. Additional support from Frederieke Taylor. Closing party sponsored by Clay.